It is hard to fathom the extent to which Cathy Schiro O’Brien dominated high school running in the early 1980s, but everything you are about to read is true. Schiro was in seventh grade when she went out for the track team at Dover High in 1980. She was the youngest of four kids from a non-athletic family. At the time, girls distance running was something new. Middle schoolers were allowed to run with high school teams, if their school had one. A lot of schools did not yet have girls teams. 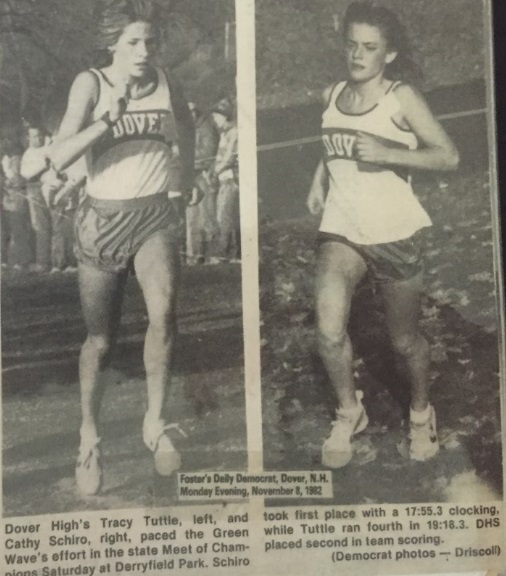 A local runner who worked for the Keds shoe company, Tom Dowling, noticed Schiro running laps, recognized she had ability, and encouraged her to go out for the Dover High Cross Country team in the fall. Dowling was going to be the team’s new coach. So many success stories have a little serendipity to them like that. The odds of a talent like Schiro being in the same school system as a coach like Dowling are vanishingly small. This was even truer in 1980, when there were still some who questioned whether supposedly fragile girls had the stamina to run over a mile or two. The longest event for women at the Olympics that year was 5000 meters. High school girls had only recently been allowed to race more than 2 miles. Had Schiro been born a couple years earlier, or lived a few miles away in another town, it’s altogether possible that she might never have discovered or developed her gift. Schiro was an immediate success. 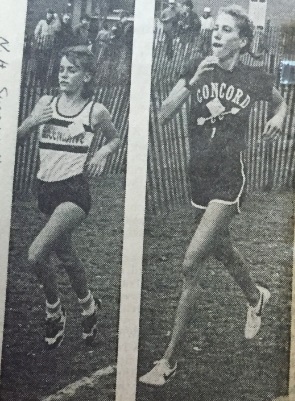 In her first cross country meet in September 1980, a contest at Kingswood with Laconia and Franklin, the eighth grader took a wrong turn, but still won the race by nearly a minute. By the end of September, she had won three more meets, setting course records at Dover and Portsmouth. A sportswriter at Fosters Daily Democrat newspaper wrote that Schiro seemed, “destined for stardom.” Coach Dowling publicly predicted she would be state champion by her sophomore year. 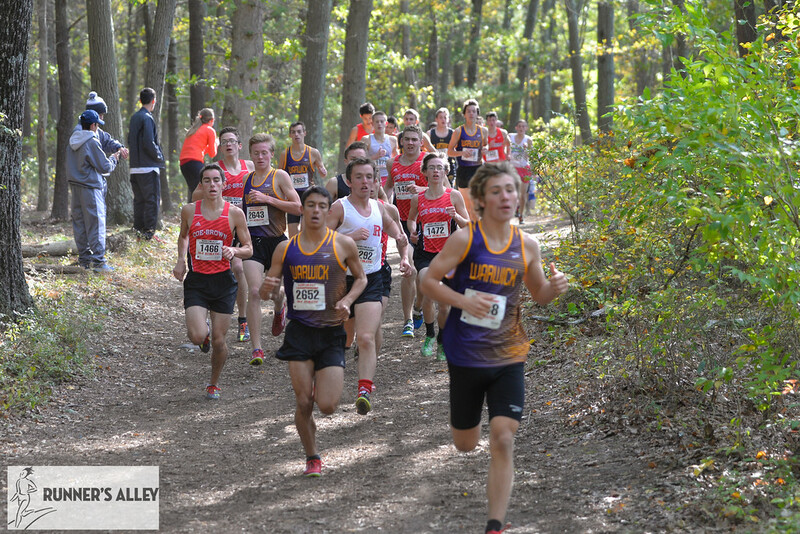 After winning the middle school state championship race at Londonderry, a week later Schiro ran in the Class L (now called Division I) championship at Derryfield Park in Manchester. In the last mile, Schiro passed state 1600 champ Barbara Higgins of Concord (today the coach at Bow High School) to move into second, then caught the state 3200 champ, Memorial’s Marty Shea, with 300 meters to go before opening up to a 9 second win in 17:44. (Note: The Derryfield course changed in 1983, but it was still a 5K course in 1980.) Dover placed four runners in the top ten to win the team title with 38 points. Runner-up Pinkerton, which had not lost a meet in the previous two seasons including back-to-back New England titles, placed second. After that race, Dowling described Schiro as future Olympic material. She was 13. She was in eighth grade. The following week Schiro ran 17:19 to win the Meet of Champions at Derryfield, breaking the course record of 17:29 held by Higgins. With a top five comprised of two eighth graders and three freshmen trained by Dowling, Dover took the team title. In those years only New Hampshire, Vermont, and Rhode Island participated in what was called the New Englands. 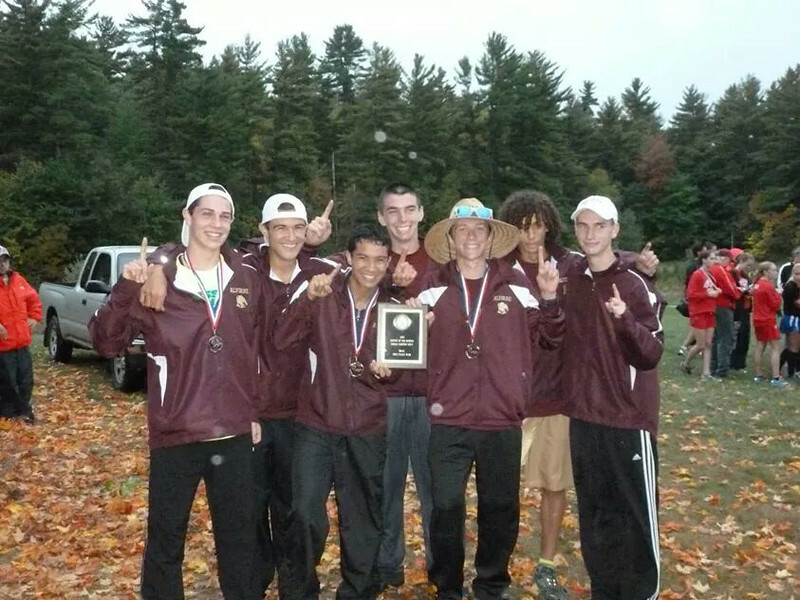 Held again at Derryfield Park a week after the Meet of Champs, Schiro ran 17:25 to win the race by 40 seconds. Higgins was second. Dover took the team title. In December, Schiro won a national 12-14 year old age group championship at The Track and Field Association / US (now USATF) meet in North Carolina. To raise money for the trip, the Dover girls organized a 60-mile relay run from the State House in Concord to Dover. Sports Illustrated included Schiro in its ‘Faces in the Crowd’ feature (She would be highlighted in Faces a second time, in 1982). The Union Leader newspaper named her the state’s female athlete of the year and speculated that she might be a future Olympian. So, you could say Schiro had a pretty good season for her first year of running. In spring track, the eighth grader went undefeated until the Class meet and the Meet of Champions, where she placed second in the 1600 and the 3200 in both meets. In a head-to-head duel with Higgins, both girls broke 5 minutes for the 1600. 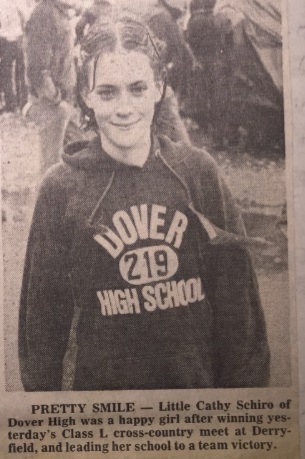 In 1981, now a freshman at Dover High, Schiro went undefeated in cross country, including winning the Class L, Meet of Champions, and New England titles again. Dover again swept the team titles in all three championship meets. At Kinney Regionals (now Footlocker) at Van Cortland Park in the Bronx, Schiro placed third, earning a trip to nationals in Florida, where she placed 19th. In spring track, the freshman ran 10:30 for the 3200, setting a New England record. She was just getting started. 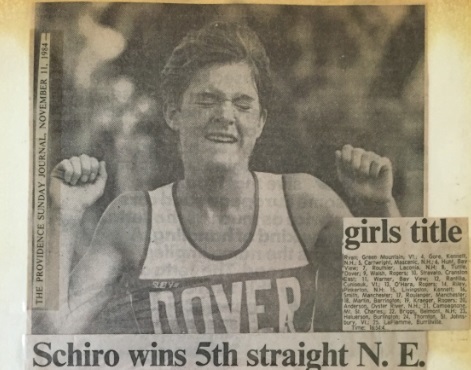 In her sophomore year of cross country, in 1982, Schiro won both the Class L and Meet of Champions races by more than a minute. The New England meet, again held at Derryfield and still featuring three states, was closer. Schiro won it by only 48 seconds. Dover swept the team titles for a third year in a row. That year Schiro placed fourth at Kinney Regionals and 10th in the national championship. At the January 1983 Dartmouth Relays, the sophomore set national records for three miles and 5K running 16:57.5. Two months later she lowered both marks with a 16:52.5 in a meet at Yale. In spring track, she set state records in the 1600 (4:53.5, breaking a 4:56 mark established by Higgins the year before) and lowered her own 3200 mark to 10:29. (Her division championship mile record set that year stood 32 years until 2015, when Exeter’s Shannon Murdoch, now running for UNH, broke it.) Running in the national The Athletic Conference (TAC) 10K championships against adults that spring, Schiro placed 7th overall. She was no longer just an outstanding high school runner. She was emerging as a national class athlete. As it turned out, she would not run high school track again, skipping it in her junior and senior years. She started to travel out of state more often to find competition. In the fall of her junior year, 1983, while other New Hampshire high schoolers were going to the Manchester Invitational, Schiro went to Central Park in New York City to run the Avon Half Marathon, then the biggest half marathon in the world and one used as a tune-up race for many training for the New York City marathon. Schiro won the race by more than 2 minutes. Her time, 1:13:19, set a U.S. junior national record. The New York Times ran a photo of the kid with the adult runners who placed a distant second and third. A month later, Schiro won her fourth Class L title in 17:49 on the newly–redesigned Derryfield Park course. (For the first time, the start was moved to the bottom of the hill). Her margin of victory was 1 minute, 35 seconds. According to a Union Leader newspaper account of the race, “Schiro easily won the Class L race by such a wide margin that she was able to clear the chute, have her racing tag checked, and then become a spectator in the midst of the crowd cheering on her teammate,” Tracey Tuttle, who placed second. The following week, she won the Meet of Champions by 1 minute, 14 seconds, shaving two seconds off her new course record to 17:47. The three-state New Englands were held at Bryant College in Rhode Island that year. Schiro won by 1 minute, 7 seconds and broke the course record, which had been set by a collegiate runner, by 20 seconds. She broke the high school course record by a full minute. “She is in another world from everyone else in high school,” a Rhode Island sportswriter marveled. That year she placed second at Kinney Regionals and third at Nationals in San Diego. Half way through her junior year in high school, the 16 year old Schiro had already done just about everything a high school runner could do. She had no true competitor besides the clock. She needed another goal. Her coaches, Tom and Marcia Dowling, presented her with a choice: Would you like to run track that year, or would you like to run in the Olympic Trials in the marathon? That year, 1984, was the first year the women’s marathon would be contested at the Olympic Games. Schiro opted to go for the Trials. Needing a qualifying time (the mark was 2:51), in February Schiro entered a marathon held in Hampton, NH and won it in 2:45:16 (6:30 pace) to qualify for the Trials. Then she won the New Bedford Half-Marathon in 1:16:09, breaking the course record. She also set an indoor 10K junior national record during this time. The women’s Olympic marathon trials were held in May in Olympia, Washington. Schiro, the 16 year old high school junior, was the youngest of 266 qualifiers. Her roommate, a 54 year old nun, was the oldest. Schiro went to the race with a plan to run around 6 minute pace, but with no expectations for place beyond gaining experience. At the track and field trials that year, Schiro competed in an exhibition 10K on the track, that distance not yet being an Olympic event. She ran 33:26, setting yet another national junior record. Schiro began her senior year of high school by running, but not racing, a marathon in Paris sponsored by Avon; a trip she qualified for by winning the Avon Half Marathon in New York the year before. Her one remaining goal was winning Kinney Nationals. She would often do her long runs with college aged men and grad students from UNH. They’d refuel by getting milkshakes at the Dairy Bar after runs. That fall she ran one regular high school meet to make her eligible for the championship meets. Schiro won her fifth Class L title in a course record 17:32, but it should have been faster. From an account in the Union Leader: “As Schiro neared the conclusion of the race, the Dover senior missed a turn and ran approximately 25 yards out of the way. She then had to retrace her steps and complete the course. The delay cost her approximately 20 seconds.” She still topped her nearest competitor, teammate Tuttle, by 1 minute and 2 seconds. At the Meet of Champions the following week, Schiro followed the course the right way and ran 17:18 while winning by 1:15, with Tuttle again in second. She then won New Englands by 1:15 as well. Her margin was so big that “one might have thought the other runners were lost,” according to an account in the Union Leader. Five years, five Class L titles, five Meet of Champions titles, five New Englands titles. “I was so nervous before the race,” Schiro told a reporter afterwards. “Everyone expects me to do well, and I wanted to win this one. Now it’s the end, and I’ve got them all.” It was her last race representing Dover High. “My long range goal is to participate in the 1988 Olympics. If I train hard, avoid injury, and if I really want it, I feel very confident that I will be there,” she said. That fall, Schiro won the Kinney Regional meet at Van Cortland Park by 59 seconds. 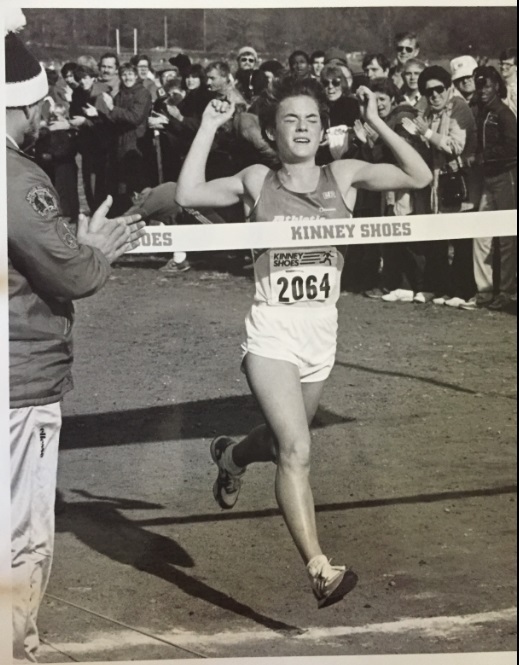 Her time, 16:46, still stands as the high school course record today, some 32 years later. She won the national meet a week later. In four years, her progression at nationals was 19th, 10th, 3rd, 1st. She was national champion. Schiro was at a pinnacle. She was 17 years old, a senior in high school. For five years, she had experienced nothing in athletics, but one tremendous success after another. She’d achieved long-held goals of qualifying for the Olympic Trials and winning a national championship. She held a bunch of national records. Every college wanted her to run for them. Schiro didn’t know it at the time, but she was about to go through a trial unlike any she had experienced before. Part 2 – Next Week! I remember Cathy from back then. As team mates with one of the best runners of the time I was able to interact with Cathy at races vicariously through my team mate. I remember being camped out next to Dover, our coach talking with hers at Derryfield Park and simply being in awe of this little girl putting it to everyone by such a tremendous amount. When I heard she was running the Olympic trials while a HSer (for the marathon) which you might have thought sounds crazy, it seemed like a logical choice for her. This is such a great read and brings me back. Yeah, this takes me back. I was running for Manchester Central at the time and whenever Dover was competing there was always buzz in the park “Schiro’s running today! You’re going to want to see this!” See it we did. Believe it we couldn’t.